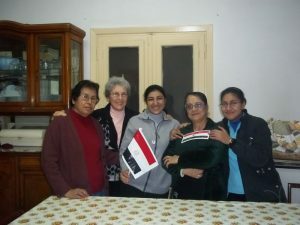 Sisters of Sion have been in Cairo since 1971 when a small community was established in the area of Materaya, the ancient “Heliopolis” mentioned in Jer. 43:13. [Only one obelisk remains…were there others as the Jeremiah text indicates?… which is one of the most beautiful in Egypt and is visited by many tourists.] A second community was opened in 1975 for the younger Egyptian sisters who had been in Lebanon for studies. At the time of the Lebanese civil war the General Council decided to close the community in Beirut and to send the Egyptian sisters back to Egypt. A small community (Mona, Carina, Emtissal, Mireille Gilles) was set up in the area of Daher in an old apartment on Kobeissy St. The district of Daher and neighbouring Abbassiya still show some signs of a Jewish community which once lived there. At the time the sisters moved to this area there were many buildings in very bad condition. However since then most of these buildings have been replaced by upmarket apartment buildings, shops and small supermarkets. There are also many churches in the area (Coptic Orthodox and Catholic, Syrian, Greek and Chaldean Catholic, Armenian and Greek Orthodox, Franciscan and Jesuit) testifying to its former and still fairly large Christian population. In 1985 the community moved to a newly constructed apartment at College de la Salle, also in Daher. At the moment there are 4 in the Cairo community: Carina, Mona, Darlene and Victoria, a novice. Carina’s main ministry is supervising the teaching of English in the kindergarten of the Maronite school. Her other ministries include managing “Beth Myriam” (The house of Mary, tlig.org) where poor Christians of the area can get a balanced cooked meal once a week. She also works with the College de la Salle branch of the St. Vincent de Paul organisation, which researches and helps needy Christians of the area. Mona is in charge of the kindergarten of “Mary’s Tree” in the area called Mataraya, mentioned above. “Mary’s Tree” refers to the place, one of many in Egypt, where the Holy Family found refuge during their sojourn here. Legend has it that Mary rested with her child under a sycamore tree which bent its branches to give her its fruit. This tree across the street from the kindergarten, now only a large stump, is visited by many tourists. Its “daughter” is a living sycamore tree still bearing fruit in the playground. 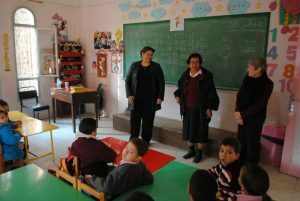 The kindergarten was founded by French sisters of Sion when they came from Alexandria to begin a foundation in this densely populated area of Cairo in 1971. Some years later the congregation asked Caritas Egypt to take on the general administration of the kindergarten, but until today it has been a sister of Sion who has assumed it direction. It works in close collaboration with the Caritas Center across the street which tries to meet the needs of the people of the area providing health care, literacy, classes for the handicapped,etc. The kindergarten has regular classes to prepare children for school entry and it also provides day care for younger children whose parents both work. Darlene, Canadian, has recently returned to Egypt after spending 6 years with the leadership team in Rome. This year she will be working part time at the Coptic Catholic Seminary in Maadi/Cairo, helping the 1st and 2nd year students with their English. She is also teaching a course in English for the Philosophy and Theology students who wish to attend. The course focuses on certain Scripture texts, using some Jewish commentaries. The students have begun the class with enthusiasm, eager to learn more about the culture of Jesus’ people. This year the community has the joy, privilege and responsibility of welcoming Victoria, a young woman from Berba who recently began her first year as a novice. She is doing some catechetical and theological studies as well as studies in religious life at the Sakakini Center. She also enjoys her volunteer works 2 days a week at a school for the deaf where she is learning a new language, Arabic sign language! She is also making progress in English over coffees with Darlene!